San Francisco International Airport was ground zero for national media attention as it focused on a jet crash which claimed the lives of two passengers. Although the crash was spectacular and captivated our attention….The very fact only 2 people lost their lives in the fiery mishap should have been enough to realize many other weighty events were happening around the country. Miracles happened that morning that prevented a far larger loss of life and averted tragedy of mass proportions…. Yet 2,000 miles away, far more Americans were losing their lives in horrendous violence plaguing one of our largest cities. The miracles in San Francisco that prevented far more death, were absent on the mean streets of Chicago…and there are no breathless, glamorized national talking heads reporting on it. Out of the headlines and buried on the back pages is the fact that over the 4th of July holiday, 72 American citizens were shot and 12 of them were killed in one violent city in America: Chicago, which is starting to be renamed “Chiraq” due to the violence. President Obama said if only one child’s life was saved due to his proposed gun control mandates, then his efforts would be worth it. But his hometown of Chicago is the poster child for strict gun control and has the same or worse statistics for violence as a war torn 3rd world country. Chicago: The most difficult city in the US for a law abiding citizen to legally own a firearm. Yet criminals rule the streets having gunfights while innocent bystanders get shot in the crossfire. Chicago: Under one party rule for decades and the epicenter of gun violence. 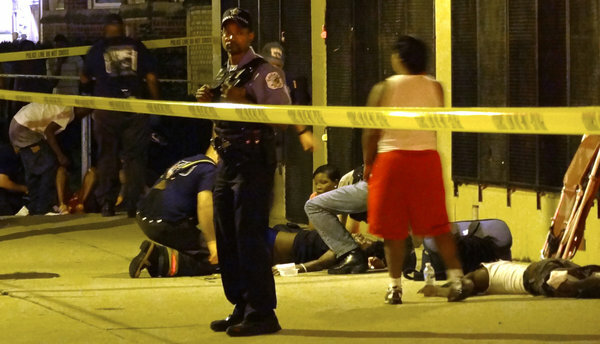 Gun crime so horrendous it skews the nation’s violence statistics. Yes the crash of the jet in San Francisco was a tragedy, but in the whole scheme of things, it was an extremely rare occurrence and the loss of life miniscule in comparison to the daily violent meat grinder of violence that the citizens of Chicago must suffer with. It is time for the media to turn its priorities to what is at the core of this violence in one of our biggest cities. Because taking away guns from law abiding American citizens is not the solution. Chicago was awash in illegal money and violence after the government declared a war on alcohol during the Prohibition era …..Perhaps it is time to examine who profits from the governments “war on drugs” and who/what is behind that violence.